02.04.19 It would be difficult to find a more poised, gracious, and inspirational representative and role model for chess than WGM Sabina Foisor. Foisor spent the weekend in Maine to help celebrate the Maine Girls' and Women's Championship tournaments played on Saturday, February 2nd at the Bangor Public Library. 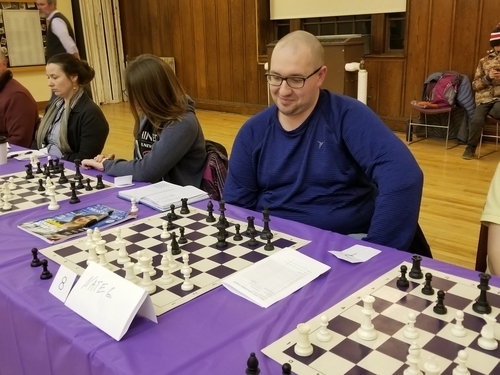 On the evening before the tournament, Foisor played thirty-nine chess competitors, some of whom were rated over USCF 1700, simultaneously. 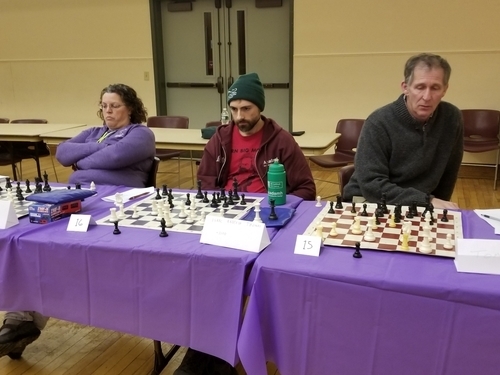 A grueling five hours later, when the simul had concluded, Foisor's impressive record stood at 33 wins, four draws, and two losses. 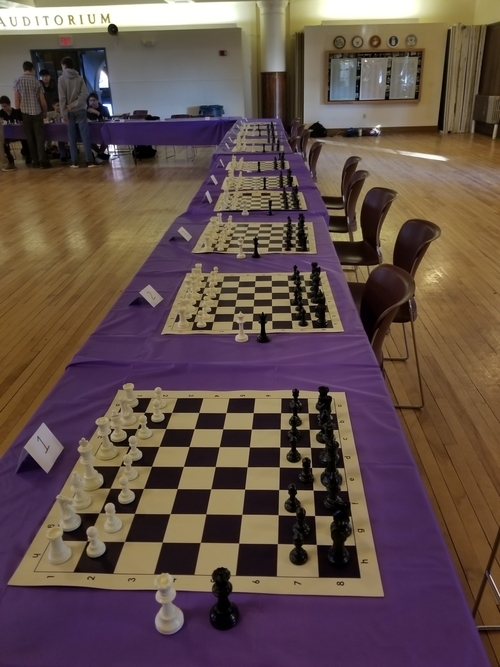 Here's an illustrated report of the simultaneous chess exhibition and a replay of one the WGM's only two losses. 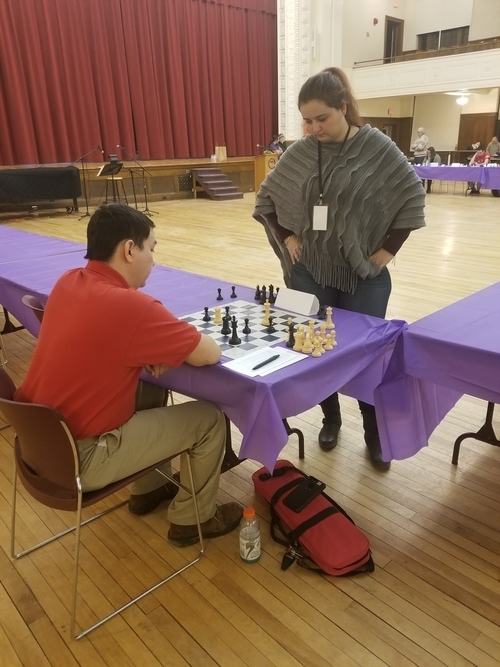 Maine Chess Association president Michael Dudley introduces WGM Sabina Foisor to participants awaiting their opportunity to play the 2017 U.S. Women's Champion in a 40-board simultaneous chess exhibition on Friday evening, February 1st at John Bapst Memorial High School in Bangor, Maine. 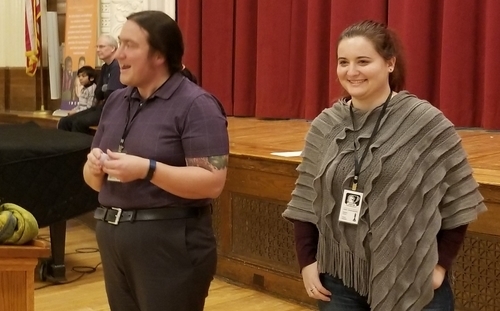 There was excitement and anticipation in the air when WGM Sabina Foisor approached the podium and was introduced by Maine Chess Association president Michael Dudley. 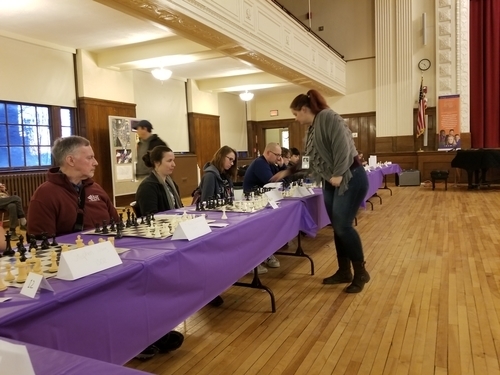 She greeted the assembled crowd, expressed her gratitude for the invitation to Maine, summarized a few rules for the simul, then quickly got down to the business of playing thirty-nine opponents at the same time. 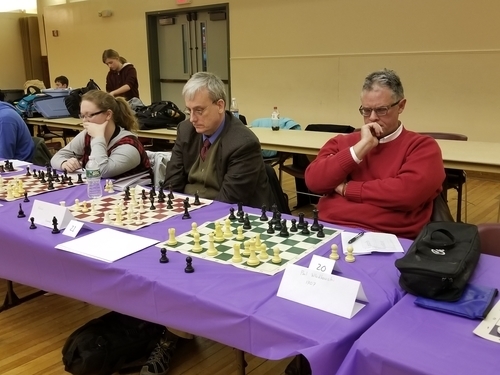 Maine chess players have a reputation for being somewhat under rated due to less opportunities to "cross pollinate" with higher-rated opponents in more metropolitan areas such as Boston or New York, for example. This factor came into play as WGM Foisor's lower-rated but still fairly strong and sometimes tricky opponents kept her on her toes for the better part of five hours! In the end, the 2017 U.S. Women's Champion defeated all but six player--conceding two losses and four draws. 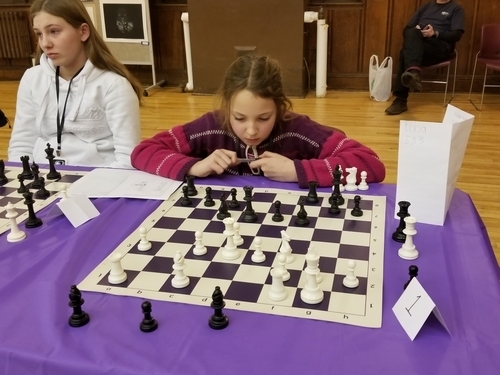 Her planned lecture on the evening of the simul was replaced by one-on-one game analysis and coaching the following day at the Girls' and Women's Championships. After the simul, WGM Foisor was presented with various gifts from Maine including Maine-made maple syrup, honey, goat-milk soap, a book-written by a Maine author, and other Maine treats. 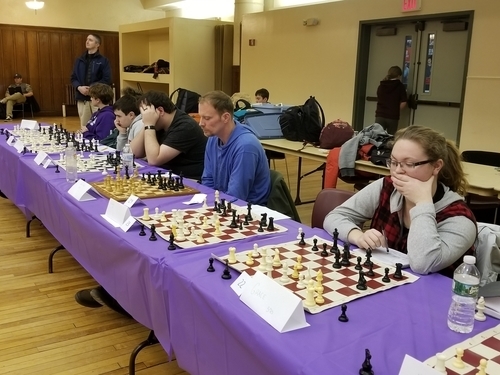 It was an incredible honor an privilege to host this great ambassador of chess in Maine. We hope that she returns to the Pine Tree State soon for more chess-related activities! 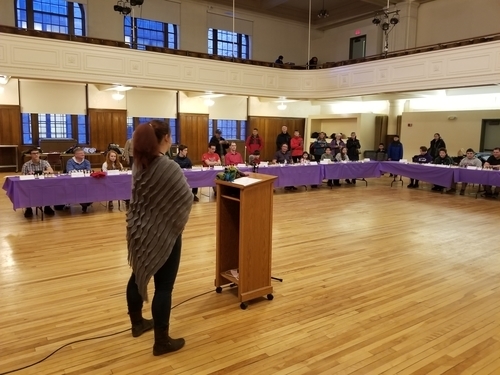 The Bangor Daily News was on site and BDN staff reporter Nina Mahaleris submitted this report. 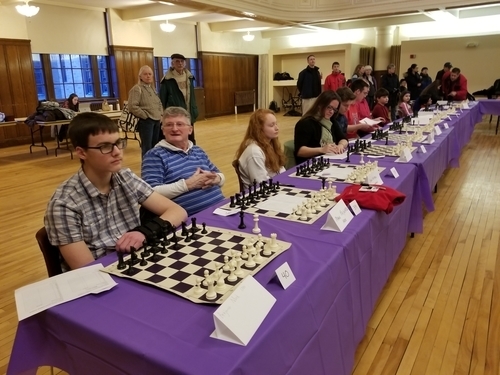 Congratulations to the two players who were able to defeat WGM Foisor in the simul: Dan Robbins and Tom Batt. Here is the game Foisor-Robbins. and players anxiously await their opponent. The 2017 U.S. Women's Champion addresses the players before the games begin. and experience enjoyed the challenge. Foisor moved quickly around the room usually making a move instantly upon arriving at a board. But sometimes pausing to ponder an interesting position before committing to a decision. Hats off to the four players who managed to draw with the Women's Grandmaster including Steve Wong. The Maine players brought their A Game! 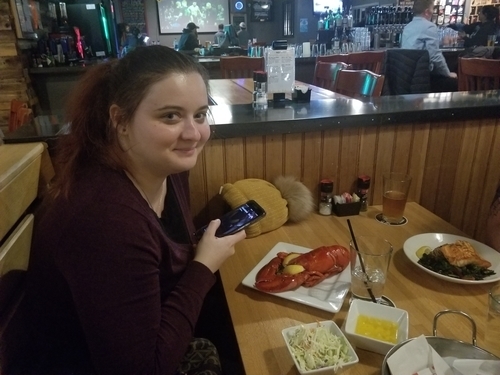 After the simul, Foisor enjoyed a delectable Maine tradition at the Sea Dog Brewing Company in Bangor. 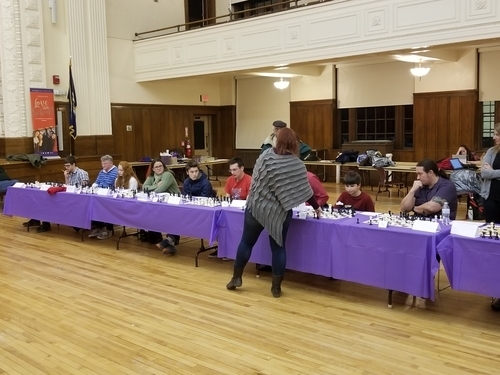 Thank you to everyone who made this such a special event, and thanks especially to the Crusader Chess Club, who set up the simul in record time!